I suppose I must establish my patch before going further. I'm not really a royalist, but I do recognise the existence of royalty in many societies, and the importance of the role it plays. I won't go into that role except to say that for many, many people, the presence of royalty is a focal point, a rallying point, rooted in national or imperial history, and difficult to expunge. My family comes from a diverse selection of British roots, and has some touches of the European continent too, to stir matters. Just to complicate things further, my daughter has married back into the "old country" and those of us who find these things interesting will heave a sigh of despair. Round and round we go. I'm a third-generation South African whose grandparents arrived from Blighty in the late nineteenth century and put down roots that continue to grow and to enrich our society. In that large family there were those devoted to the Kings and Queen of their time, and those who were no doubt opposed to them. None of this matters. It's all grist for the mill. Each generation makes its own way in the wake of those who went before, or in spite of those who trod the path ahead. In the nineteen-forties the Britsh Royal Family was invited to visit South Africa by the then SA Prime Minister, Jan Smuts. It was to be a first visit to African shores for the monarch, and there were weighty political issues in the air in this country, the Union of South Africa, which was on the threshold of an important election. The Second World War had just become history, and the rulers of empire were still reeling from the strains of the previous decade and more. What better way to ring the changes than to do something totally new? And so the family set sail (figuratively) for an African odyssey. The family was to endure a seemingly endless roundabout of engagements around the country, and Prime Minister Smuts saw fit to include a respite amid some one hundred and twenty official functions. 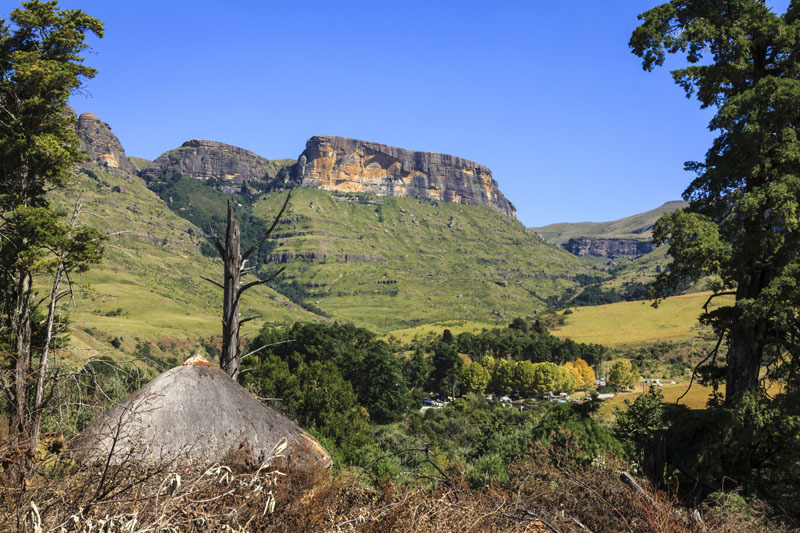 This was to happen in a remote nature reserve in the northern part of the Drakensberg mountains. 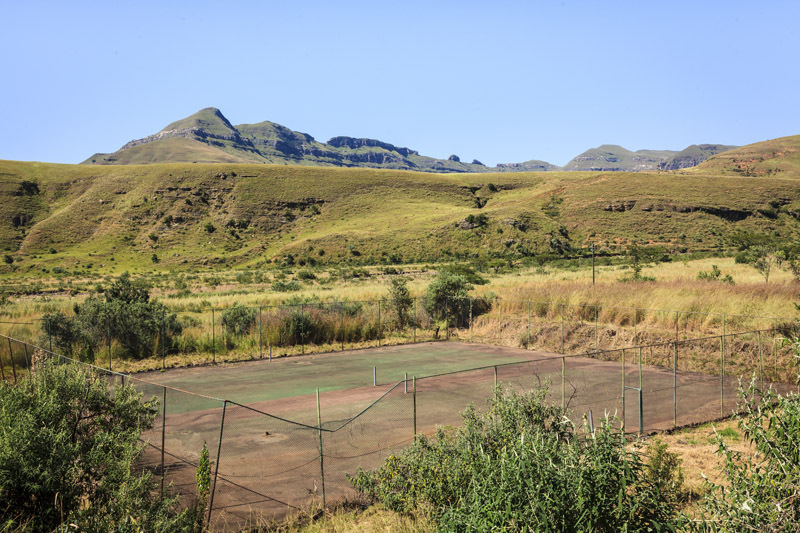 The reserve included the magnificent Amphitheatre as well as the beautiful foothills now known as the Little Berg. The mountains backed onto the then protectorate of Basutholand, which was later to gain independence from the Crown and would be known as Lesotho. Smuts was to be the family's host at an hotel in this reserve. 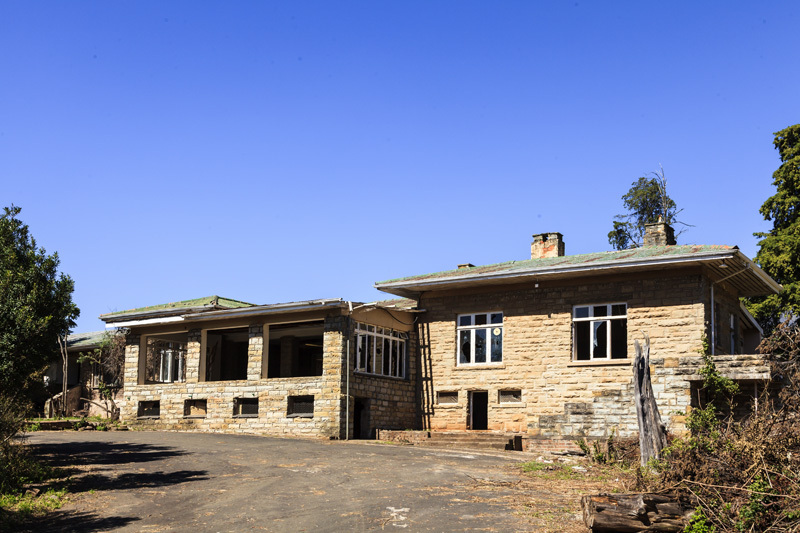 The visit of the Royal Family gave rise to the re-naming of the reserve as the Royal Natal National Park, and the hotel was thereafter known as the Royal Natal National Park Hotel, becoming a landmark historically, and a very sought-after destination for local and international travellers. Set in the splendour of the Amphitheatre, the hotel was possibly the best-situated hostelry in the country. It had had its beginnings as a lodge for hikers and climbers, but had advanced beyond the basic "travellers' doss-house." It had become capable of hosting high-profile visitors. Strangely though, the view of the mountains had been ignored with the buildings facing the other way, despite the superb setting. The visit took place in 1947, the family consisting of King George VI, the soon-to-be Queen Mother Elizabeth Bowes-Lyons, their elder daughter, Princess Elizabeth and second daughter Princess Margaret. The queen-in-waiting, Princess Elizabeth, Duchess of Edinburgh, was to celebrate her twenty-first birthday in this remote place, and here she composed her first major public address to the people of the British Empire, that of her coming-of-age. It's now 2012. Sixty-five years on. It's the year of Princess Elizabeth's Diamond Jubilee, having ascended to the throne on the death of her father, George VI, in 1952 to be crowned Queen Elizabeth II. Things have changed everywhere. South Africa has been a republic outside of the British Empire since 1961, but has been re-admitted to the Commonwealth on the demise of the apartheid rule of the republic. The Queen is not South Africa's head of state, but the country remains a member of the Commonwealth. Things have not gone that well for the hotel, though. 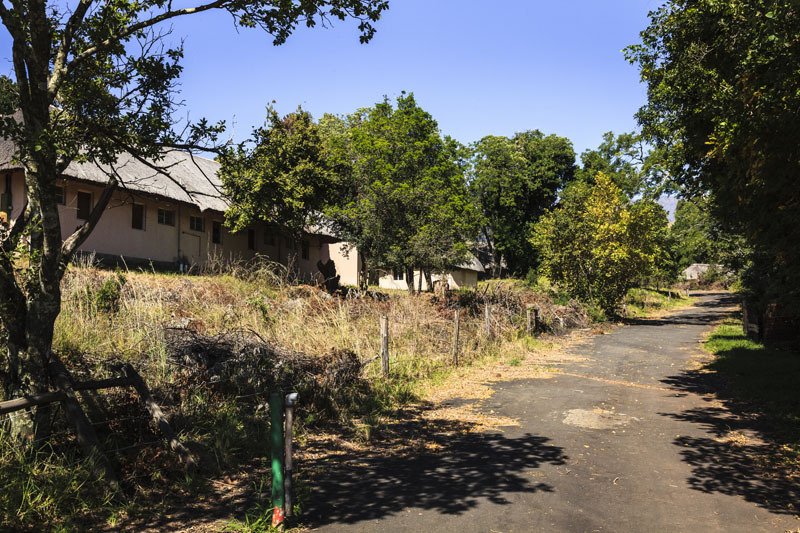 The Royal Natal was for many years a name to be conjured with, a place to have visited, where the dust of illustrious history might well rub off one the visitor. Tourists came from far and wide, and even from next door, to sample the excellence and atmosphere of the grand place. 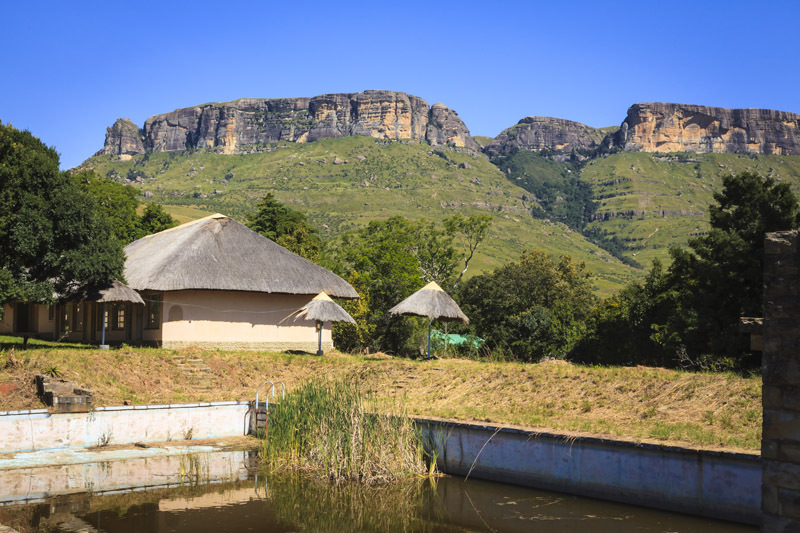 The Royal Natal National Park grew in stature, and the establishment of the Mahai campsite and the hutted camp of Thendele cemented this reserve's reputation as a prime destination. For the hotel, it didn't last. The end came quite suddenly, and it was a shock to see the grand lady die. I can clearly remember booking in for a night in 1985 because snow had begun to fall and we wanted to experience it. 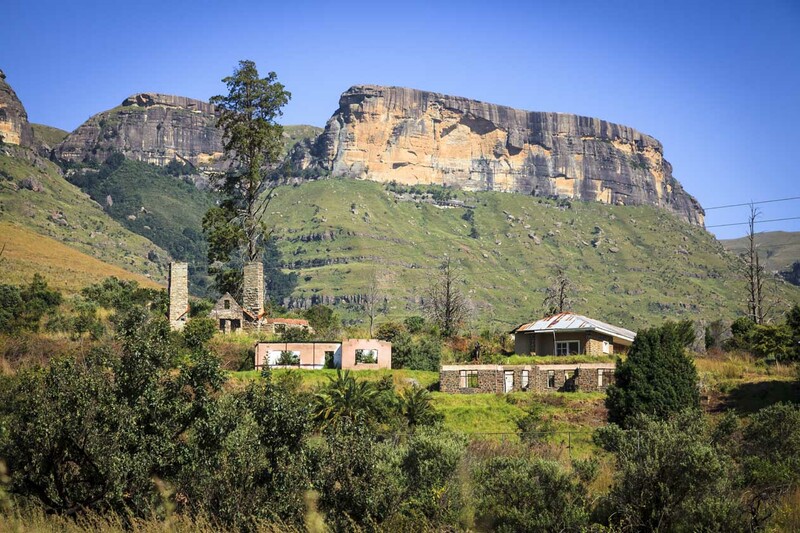 There were roaring log fires in the lounge and dining room, and although the feel was quite colonial, the atmosphere was that of an profound enjoyment of the Drakensberg. Many years have passed since that day, and a few days ago I paid another visit. There's just about nothing left. The shells of the buildings still stand, and it looks as if the dereliction has been greater than we now see. Some effort has been made to tidy up the premises, and to clean up the devastated buildings. All about is the evidence of past order, but recently severed tree trunks in verandah spaces tell of decades of neglect and of the return of nature in an effort to reclaim its own territory. The entrance driveway has seemingly not seen a more sophisticated vehicle than a truck or a tractor for decades. I well recall this entrance as being a little daunting - a conduit to someone else's world. Arrival at reception was different this time. Last time around we were there because the snow was beginning to fall. This time the sun was scalding us. Last time the place teemed with excited and contented guests, but now we stood alone. The hills and mountains were just as lovely and dramatic as in 1985 when we'd last been there, but all around us was decay and ruin. The once elegant entrance was littered with broken glass and an empty beer bottle on a column that no longer supported a light fitting. 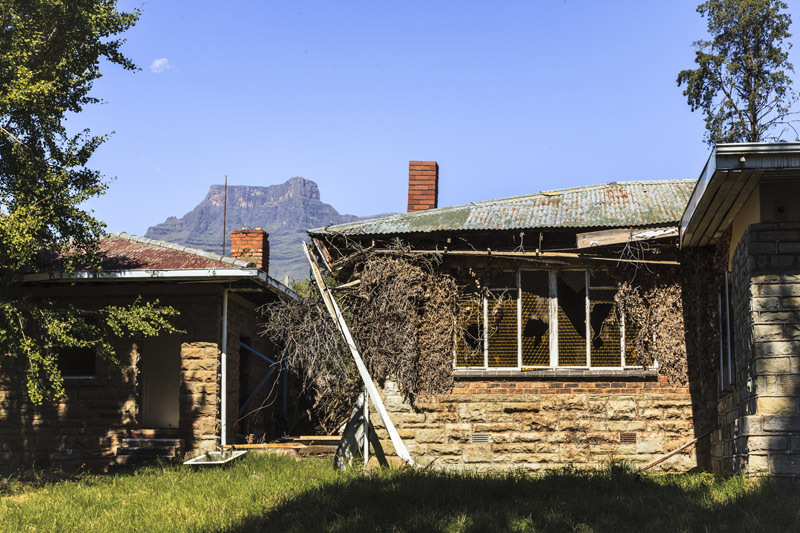 The rondavels that had once been the mainstay of the accommodation stood in tatters. It was obvious that some work was being done, as evidenced by a row of baths stacked in the grounds. Even with the clean-up that had evidently taken place, it was a forlorn sight. The main buildings were no better and will have offended the memories of those who were grateful and appreciative guests some decades ago. Indeed I felt a sense of anger that what had been so good and desirable had been relegated to the scrapheap of tourism with no thought for the future. The interiors, if one could distinguish, were even worse. 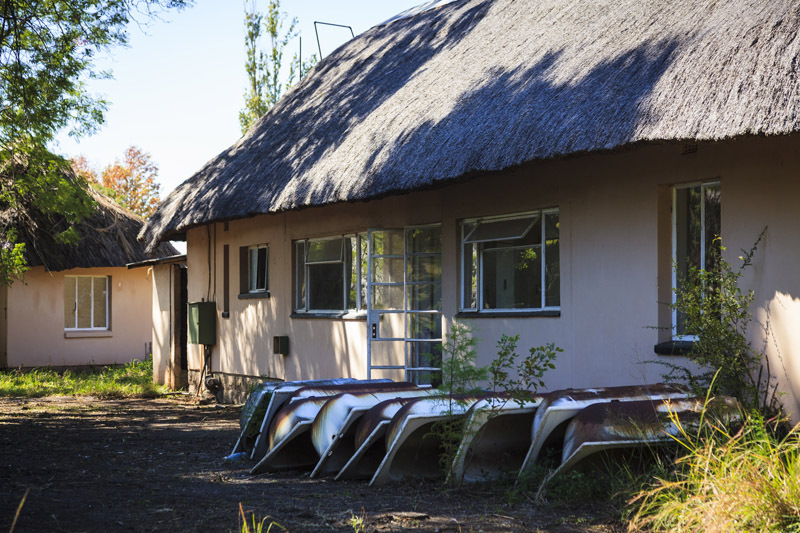 This was where not just royal guests, but many thousands of discerning visitors had lodged and had willingly paid to be part of the Drakensberg experience. Having parked the car, carried in the luggage, signed the register, warmed hands in front of the blazing fire, the guest entered a world that existed almost by accident. 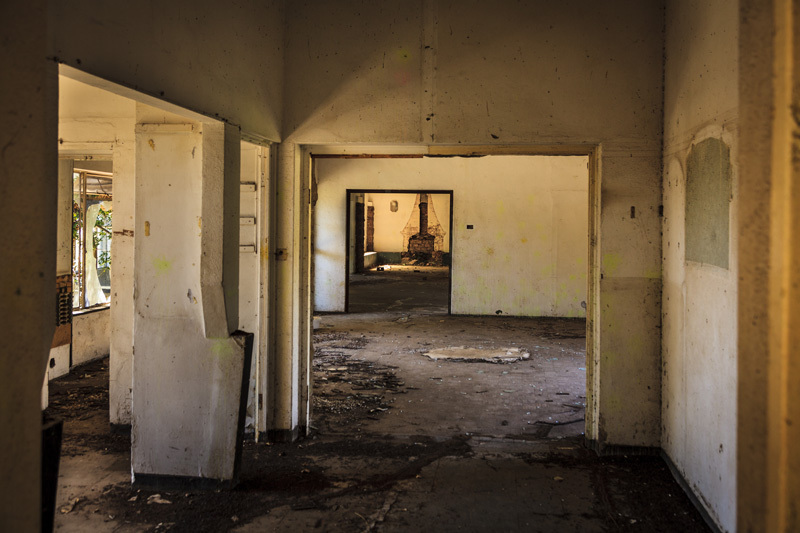 Here was a first-class operation in a rural space, and no requirement was neglected. I was stunned to see how little had survived. 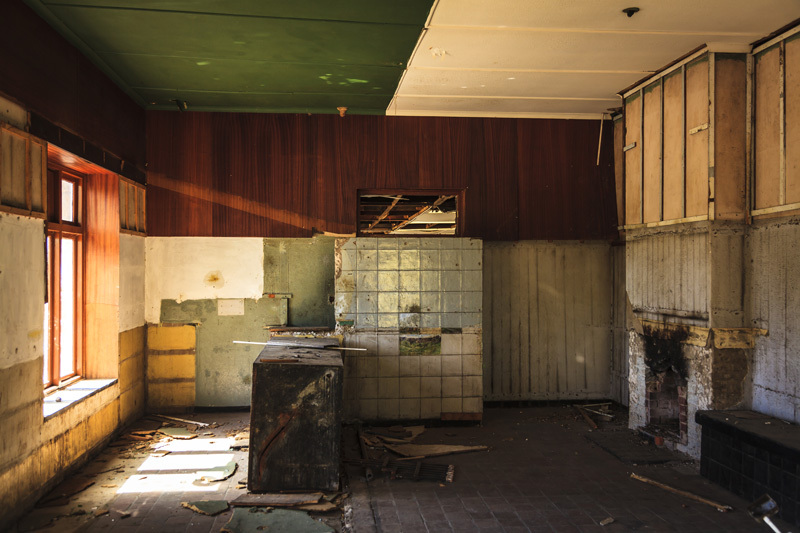 Even the pub which had been the scene of countless discussions, debates, lessons, lectures and even arguments over the years, had been reduced to a raw shell. Few tourists can forget the ambience of the bar, with the fire roaring in the grate and local guides and experts holding court on the condition and qualities of the property, regaling the listeners with accounts of climbing feats, encounters with wildlife and desperate rescues of less than careful visitors, the barman calling for orders, and the following day beckoning through the deep of the night. 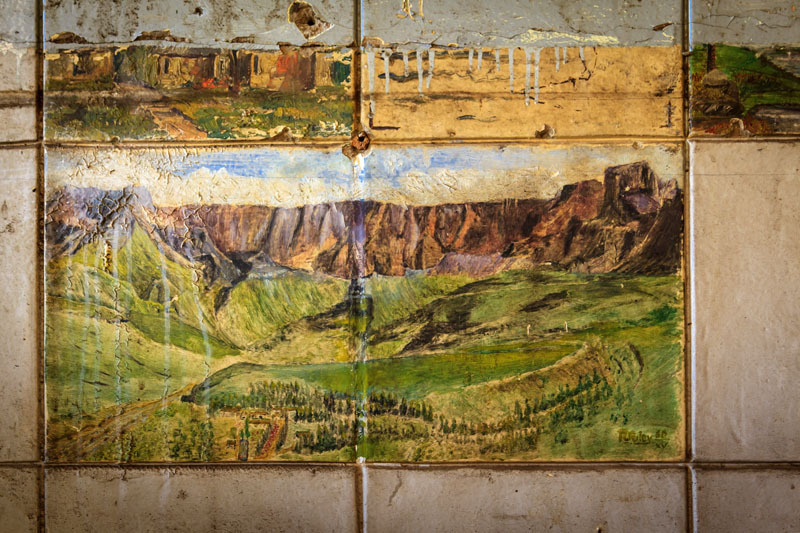 A poignant reminder of the love of the area can still be seen on the wall of the old pub, in the form of an amateur mural on wall tiles, depicting a view of the Amphitheatre. while the swimming pool is a region of devastation. In working times it seems that part of a mountain stream was diverted into the pool, and that chemical treatment was probably not needed. 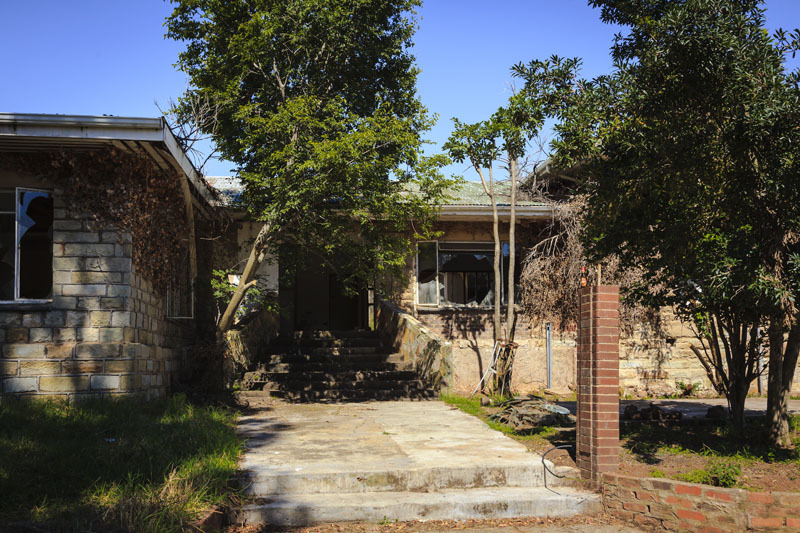 Since then the entire structure has been allowed to deteriorate, with aquatic plants taking root in the pool, the pool house in ruins, and the whole surrounded by signs forbidding anyone to proceed beyond "this point." 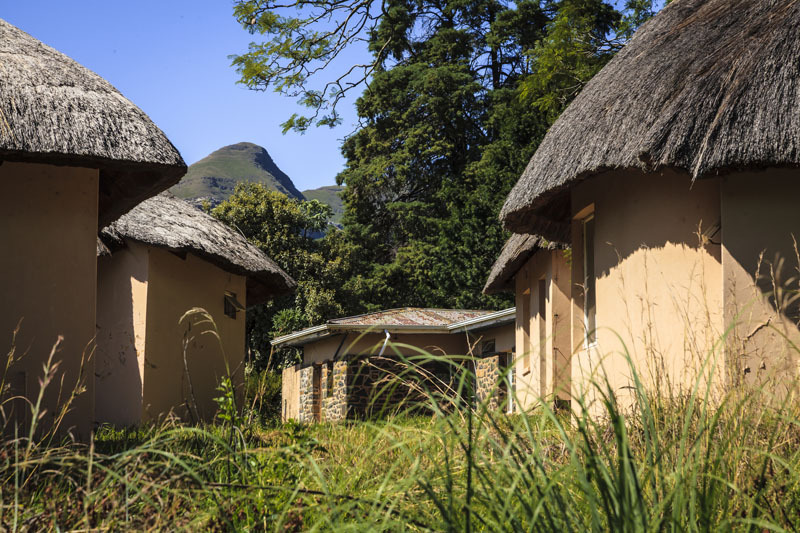 The pool house, of course, is history, and nothing remains of what was once a truly fulfilling and enjoyable experience of the atmosphere of the Drakensberg. I'm looking into the history of the property, and will publish further blogs on the topic as I come across useful and interesting information. I'll be trying to garner the assistance of the British Royal Family or their representatives, and invite anyone and everyone to contribute any snippets of information, anecdotes and photographs that may be at hand. Terri and I hope this post has been interesting. We loved doing it. Sad Sight - Some things are hard to see, and this is one of them. Sad though it is, thank you for capturing with your photos and words the reality of what has become of it. I remember a family visit to this grand old place as long ago as 1960, and can hardly credit what has been allowed to happen to it. Hi thanks for this. I worked at the old hotel and absolutely loved it. I needed to see these pics as I've heard and being a bit like an ostrich I thought maybe to keep memories good rather than face the truth. Hello Charleen We drove past the no-entry sign and walked around on th 22nd March 2014. Unfortunately the mural tiles have been removed by "collector". It was fascinating to go into the kitchen, storage area, cold rooms, and fridges. We saw chalked stock inventory on the ceiling joists on the 50's & 60's. Has any one out there have any photo"s of "The Old Lady" in her prime, inside & out of the establishment. 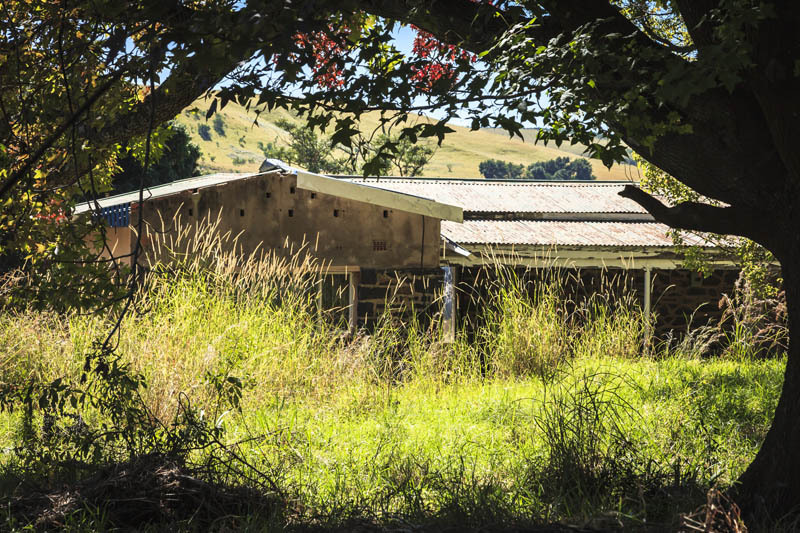 A very sad post, but also brought back happy memories of a wonderful corner of the Berg. Time marches on. I was born in 1972 and remembering coming to the Royal National Park Hotel. I brought my daughters to come and see this beautiful place that held memories and I walked through the hotel remembering the lounge, reception area, me sitting on the verandah while my parents had a drink and the old white haired man who wore red hiking clothes come in who knew every trail. What was the real reason to why it burnt down? I find it so sad to see such a majestic buildings with proud rooms be neglected. Please could you tell me more about it's burning for surely it couldn't have burnt down the entire place. Was it political? My spouse and I absolutely love your blog and find most of your post's to be exactly what I'm looking for. Would you offer guest writers to write content for yourself? I wouldn't mind composing a post or elaborating on some of the subjects you write regarding here. Again, awesome blog! It's an amazing post in favor of all the online users; they will take benefit from it I am sure. I'm shocked to say the least. We were here in the middle eighties and enjoyed stay immensely. What has happened to the trout hatcheries, the dam were you could catch your fresh trout? and then all the locals who were employed, what has happened to them? they more than likely are making up part of the 26.3%.unemployed. Oh dear! what a shame! My first job was in this hotel in 1991 as a 20 year old. It was an amazing place to work, so peaceful and beautiful. Mrs Kapp owned the lease at the time and Cyril Renee was the walking guide who's knowledge of the area was second to none. My wife and I dropped in at the hotel 3days ago 29th Feb 2016 to see for ourselves the devastation and I can report that nothing has changed. 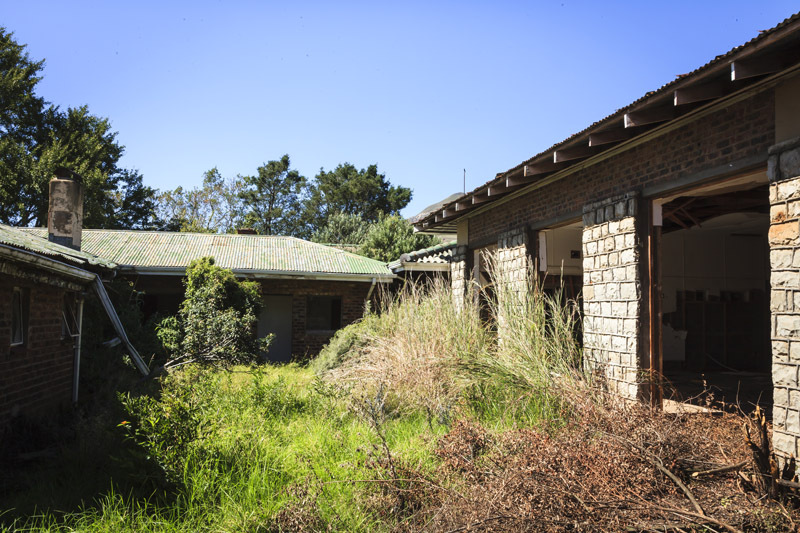 The old lady is in even more of a ruined state......shame on the parks board and South Africa. When someone writes an part of writing he/she keeps the image of the user in their/her brain that just how a user can be aware of it. Therefore that's why this bit of writing is perfect. Thanks! I love the valuable info you provide with your articles. I am going to bookmark your weblog and look again here regularly. I'm quite sure I am going to learn lots of new stuff on this site! Best of luck for the upcoming! Does your blog possess a contact page? I'm having trouble locating it but, I'd like to shoot you an e-mail. I've got some recommendations for the blog you may well be considering hearing. Either way, great blog and that i anticipate seeing it grow after a while. Wow, that's things i was looking for, just what a material! present at this internet site, thanks admin of the site. Heya i am just for the primary time here. I found this board and that i in discovering It really useful & it helped me to out a great deal. I am hoping to offer something again and help others including you helped me. Greetings from California! I'm bored to death at the office therefore i chose to take a look at your site in my iphone during lunch break. I enjoy the info you present here and can't wait to take a look after i get home. I'm amazed at how fast your blog site loaded on my small phone .. I'm not even using WIFI, just 3G .. Anyways, awesome site! Who owns the lease? Has it reverted to government ownership? Somebody needs to take on a lease - even if not to redo the property, but to at least stop it being totally destroyed without a trace! Howdy! Someone within my Facebook group shared this site around thus i came to give it a look. I'm definitely loving the details. I'm bookmarking and you will be tweeting this to my followers! Outstanding blog and excellent style and design. It's perfect time and energy to develop plans for the future and it is actually time for you to be happy. I have got look at this post and when I could I wish to suggest you few interesting things or suggestions. Perhaps you could write next articles discussing this article. I want to read more things about it! I spent two weeks in this fine hotel in September of 1967. Words fail me! !